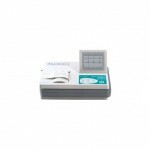 Here you will find a wide range of ECG equipment. We have everything from simple handheld ECG gauges, to PC-based ECG devices to the clinic. We can also provide advanced ECG systems for Stress ECG / Work ECG. Out of our wide range of ECG (Electrocardiography) equipment, we also have accessories for ECG optics. It is for example A varied selection of ECG electrodes at the right price. Not only does you find a good cheap ECG device with us, we can also provide you with support both before and after a purchase. We can also assist with the installation of the sisters in your clinic if required. We have cooperation with the largest medical systems in Denmark, so we know about the options your system provides. LakeIf you provide a good and cheap ECG device for general practice then you are the right place. We have what you are looking for and can help you with advice and guidance on ECG equipment.